This bulb is one of the most advanced solid-state LED RGB 5 Watt color changing bulbs available! Don't compare with cheaper bulbs! Full 50,000 hour lifetime rating, and vibrant colors. 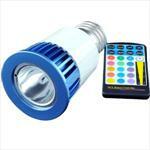 This extremely vivid LED RGB light bulb, with its rich hues, can be set to over 16 colors at the touch of a button. With 4 different light intensities, this bulb can be programmed to effortlessly cycle through all the colors of the rainbow: Red, Magenta, Burnt Orange, Orange, Yellow, Green, Mint Green, Aqua, Robin’s Egg Blue, Blue, Electric Blue, Lavender, Purple, Indigo, and White. It can be set to a fixed color, flash, strobe, fade, or smoothly transition from one color to the next. The remote even has an on/off switch. If that wasn't enough, this bulb will remember its last setting, so turning off the bulb from a regular light switch doesn't clear the programming. This low medium lumen bulb is perfect for mood lighting applications. It is not a substitute for general illumination.